Why is fantasy football so popular? Since I don’t have a television, watching football games online is the only way that I can experience the excitement. And this year, it seems like pretty much all of the commercial slots between plays are occupied by fantasy football ads. You probably have already noticed. They play it so frequently that it starts to get annoying after a while. Worse yet, the league will probably be playing these commercials for the whole season. Seeing people holding giant million-dollar checks and going crazy in the DraftKings commercial, you might just ask: is any of this even possible? Well, theoretically, yes. If you’re not a football expert, however, your chances are very slim. Fantasy football is a game within a game. But it’s not just some trivial game played for fun. By creating a second layer of interactive football on top of on-field football — usually referred to as gamification— fantasy football is able to get fans more involved with the already beloved National Football League. 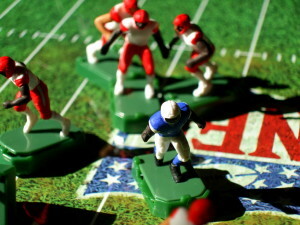 Although most fantasy leagues are not directly associated with the NFL, playing fantasy football gives the fans freedom to build their own team. Also, money is involved. While the majority of the participants play for the excitement, many people play for some serious cash. The NFL has stood strong against sports betting, just like most sports leagues. When it comes to regulating teams, however, the NFL has little power to stop teams from striking deals with third-party fantasy websites. Despite some controversial opinions, the NFL certainly didn’t invent these websites to trick fans into dumping their money into these enterprises. Fantasy sports have existed for a long time, even before consumer electronics and commercials made them popular. The key of fantasy football’s success is the way it keeps fans engaged. Fantasy football websites are like invitations for fans to take part in a game. The big prize pool and chance to win a lot of money makes the whole situation even more enticing. Here’s a proposition for an interactive football experience with only a few limitations and rules, a chance to win cash and play football as if you were in the NFL itself. To succeed in a game, the player must distinguish information that helps him achieve his goal from information that does not. Becoming a better player means doing more of that automatically. As a participant in fantasy football, you will have to study the statistics and any other factors that might influence a player’s performance. It’s a lot more than just reading articles and watching the games. How do you know if a player will perform well in the upcoming week? You don’t, but you need to predict his performance based on his past performances as well as other factors like the weather, team morale, how he lines up on the field, etc. A serious fantasy football player — and it’s hard to play this game if you’re not serious — has to know the players very well. This sounds like a lot of work and time commitment, and indeed it is. For the NFL, although it is not creating any revenue from fantasy football, this is what they want to see. The more committed the fans are, the more attention and media coverage the league gets. And the big prizes are just the tip of the iceberg. Another reason that proves that fantasy sports is a game of good skills. You need to do you research, you need to be aware and you should be committed. It’s name might be fantasy but when you win it everything is a reality. From enjoying to actually earning money. Most people i know play it for fun and they are so engaged because win or lose they enjoyed fantasy sports with their friends and relatives. Those commercials about fantasy sports are not so bad, this is just a way for them to advertise what they can offer us. Last year was a huge hit for fantasy sports and i believe in the upcoming years, they will be more popular. Let me share their website here because i know a lot of you are very much interested with fantasy sports. dfse.net – hurry up! They have a conference next year.